I stumbled across this interesting wikipedia link the other day: The Sinosphere. It’s an article on a collective of countries (area?) that forms the sinosphere. Sino is a prefix used often to relate to China and its close knit Asian geography. Its etymology comes from the latin term: sinae, which is Latin for “The Chinese”. Even some popular Mandarin/Chinese sites use this as a prefix: Sinoglot, Sinosplice. Chinese fans would often call themselves Sinophiles. However, what struck me as interesting in the Sinosphere wiki article is the Chinese name for it: 汉子文化圈. The Chinese Character Cultural Camp. It’s like a club! This includes, Vietnam, Korea, Japan, Taiwan and of course China. Look at this picture and see how Sinosphere is written within each country respectively. Notice the various phonetic scripts (above the Chinese) used to pronounce the characters in their version of it. Taiwan: Zhuyin. 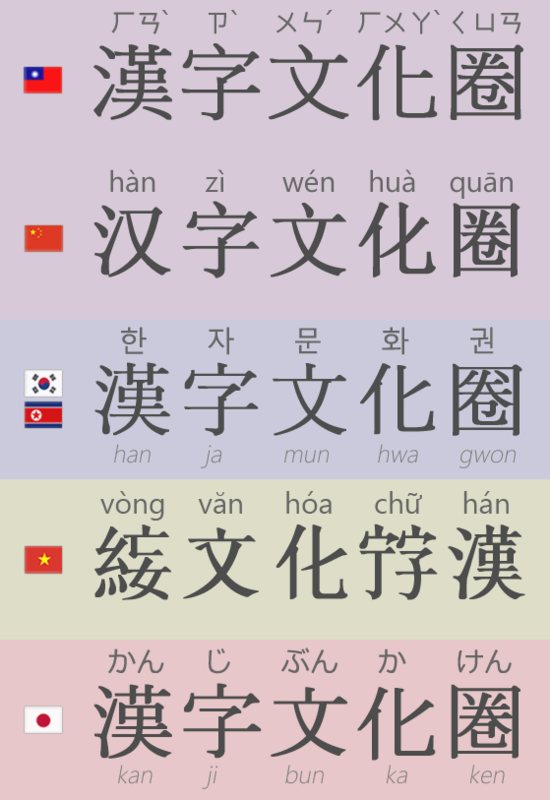 Chinese: Hanyu Pinyin. Korea: Hangul. Japan: Hiragana and Vietnam: uốc ngữ (yeah I had to look that up!). But besides all these interesting things about the Sinosphere and it being defined by the use Chinese characters (via Chinese rule), the interesting part of it, is also the that some define the Sinosphere as countries that use chopsticks everyday! Ain’t that nifty… now I wonder… doesn’t Singapore qualify for this? Mandarin is an official language there. Alas, the Sinosphere seems to harbour these three things: under Chinese rule or majority of Chinese population (or was historically), 1st language use of Chinese (emphasis on Hanzi) & chopsticks. Welcome to the Sinosphere.